New York: HarperCollins Publishers, 1996. This is the hardcover, limited first edition copy of The Fallen Man. 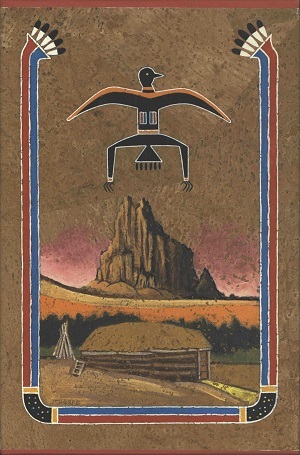 This edition comes with a multicolor slipcase designed by Peter Thorpe which pictures a pictorial representation of a bird-like Navajo Yei figure above an illustration of Ship Rock mountain. In the foreground is a hogan with light spilling out the door. The back of the slipcase features an illustration of the Father Sky figure taken from Navajo sand paintings and another Navajo Yei figure appears on the spine. This 1996 edition was publisher by HarperCollins Publishers and the book design was done by Liane Fuji. Binding: Linen colored boards with an imprint of the bird-like Yei figure on a triangle embossed in red metallic print. The spine is also lettered in red metallic print: [vertically] TONY HILLERMAN [decorative device] THE FALLEN MAN | [horizontally] Harper | Collins.